Taken from a true story, this collection of comic actors takes an absurd premise and makes it feel ordinary. Lifelong friendships are always a tricky thing to condense into a tidy frame. Sometimes people are brought together by years of complex struggles or a harrowing series of shared challenges, encapsulating the very nature of the human condition. Other times, someone writes a story about an ongoing, 30-year game of tag. Following the exploits of a group united by their annual, month-long challenges to catch each other unsuspecting in various places across the country, “Tag” faces the added challenge of finding the chemistry in a tight-knit friend group played by recognizable screen comedians. The result is much like the game it’s built around: fun for what it is, and equally disposable. Ed Helms stars as “Hoagie” Malloy, a put-together family man who, along with wife Anna (Isla Fisher), reinvigorates the yearly challenge among his compatriots. 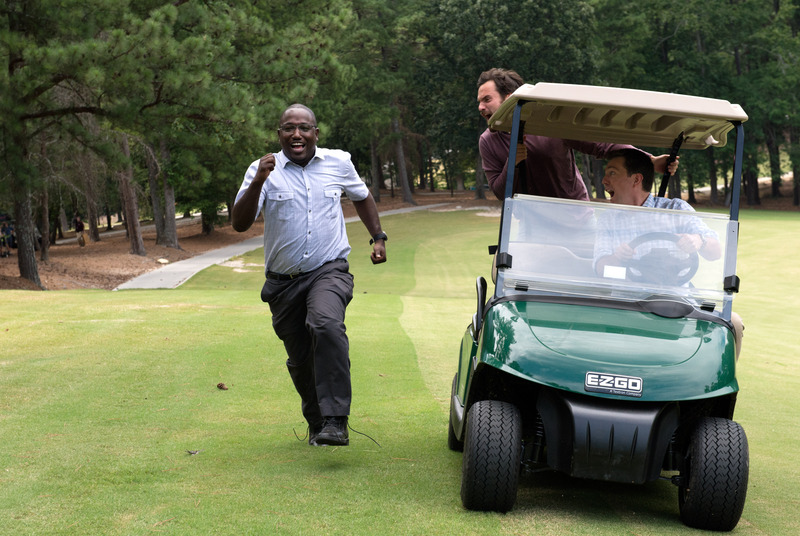 Gathering bottomed-out stoner Chilli (Jake Johnson), high-flying CEO Bob Callahan (Jon Hamm), and insecure Sable (Hannibal Buress), Hoagie makes one last-ditch pitch for the four of them to fulfill a long-running desire: Nab fellow player Jerry Pierce (Jeremy Renner), who’s never been tagged in three decades, at his upcoming wedding. For such a ridiculous story, there’s something bizarrely familiar about the whole thing, right down to the schematic approach to the characters. When Helms goes undercover to catch the other guys at work, it’s really just an excuse to put him in various goofy costumes, and Johnson plays yet another character in burnout mode on autopilot. Each man in this random assortment is painted with a broad brush, and the story aims to show how a simple child’s game can bring people together. But nothing here feels authentic enough to have stemmed from the real-life game that spawned a feature in The Wall Street Journal. 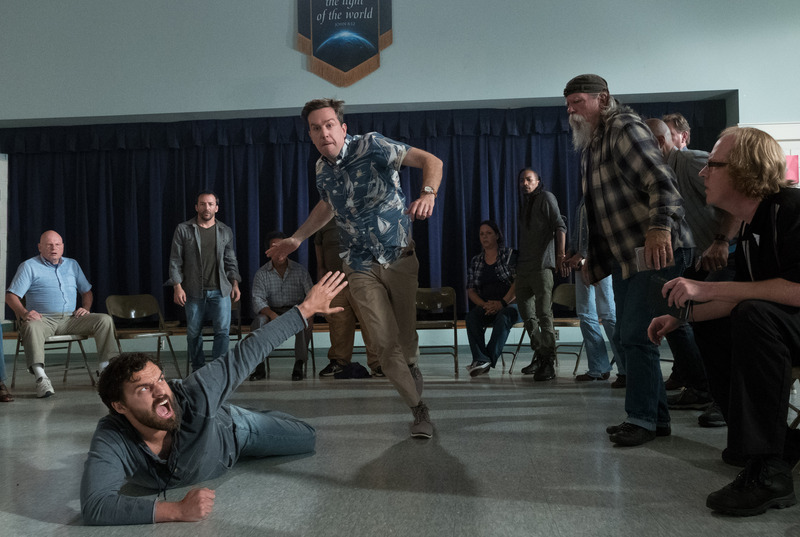 Nevertheless, “Tag” invokes that story, with Journal reporter Rebecca Crosby (Annabelle Wallis) following Hoagie and the gang as they convene on Jerry’s nuptials. Fortunately, Rob McKittrick and Mark Steilen’s script avoids forcing Rebecca into a romantic situation with any of the Tag Team. But into that void goes Rashida Jones, whose Cheryl Deakins is the object of desire for both Chilli and Callahan. Propped up merely as another wistful reminder of days past, Jones’ inclusion feels less like an extra story layer and more of an excuse to distract a few of these guys from their collective obsession for a few scenes. This friend group has all the shagginess of a collection of childhood classmates held together by little more than an annual tradition. “Tag” spends much of its running time trying to bolster the idea that these guys are lifelong friends, but the small moments when they question what it is that’s actually keeping them together is usually more interesting than the antics that come from the game that they’re playing. One exception is Renner, who may not be the star of this movie, but is certainly the biggest excuse for “Tag” to flex its goofy muscles. Like a modern-day bullet-time Sherlock Holmes, Jerry fends off all attackers with gymnastic dexterity; while the actor plays these sequences almost too cool, “Tag” certainly milks every ounce of dumb fun from Johnson, Helms, Buress, and Hamm cutting through open space in slow motion. Whenever they fail, the film succeeds. But aside from Jerry’s extreme devotion to outwitting his longtime rivals, tag is a game that’s a basic show of force. Director Jeff Tomsic maneuvers a handful of slapstick setpieces to match, including an opening scene where Hamm takes a office swivel chair right to the dome. (At least in a later sequence, when one of the friends gets a scalding hot beverage poured on them, the singe marks stick around for a couple scenes afterwards.) Aside from those snail’s-pace Jerry fight sequences, “Tag” holds back on really indulging the childlike glee of its characters until it’s too late. “Tag” is unabashedly committed to the dude quintet at the center, but it’s wise enough to let Fisher rage whenever it needs a jolt of energy. Leslie Bibb brings a tiny ounce of life to what would otherwise be a thankless soon-to-be-wife role as Jerry’s fiancée. Even among the friends, though, Buress feels more like the ancillary voice of reason than a lifelong competitor. It’s no surprise that he often teams up with the reporter assigned to be the patient observer. Sable’s lack of a life outside the game (save for one chance to bring in a criminally underused Carrie Brownstein) is the biggest hint that this central group is more a basic means to an end than a set of enduring friendships. On the continuum of 2018 movies about friends testing their relationships through trivial games, “Tag” is mostly a reminder of what works so well in “Game Night.” Here, the jokes are mostly stiff and self-referential, clinging to the broad characterizations that makes this such a motley crew. Even with the higher stakes of a nationwide, decade-spanning set up, there’s nothing in here that lends itself to an “Oh no, he died!” moment or the understated brilliance of pushing dollar bills across a table. The most “Tag” musters is the repetition of one potentially offensive word in the film’s latter third, but it’s a weak attempt at edginess. And as fun as “Tag” can get at times, its best moments only reinforce the idea that these are friends almost exclusively by circumstance. It’s something the film eventually acknowledges, but not before spending an hour and a half insisting that this is a transcendental friendship spanning time zones and major life milestones. Stuck between a hangout movie and an out-and-out caper romp, “Tag” settles for something in the middle — there are worse ways to spend your time, but the result is taking an outrageous premise and making it seem ordinary. The film’s best moments end up coming after the story is over. “Tag” has a non sequitur end credits gag that’s truly bizarre, but at least it has some of the specificity and weirdness that would have livened the movie that preceded it. The archival footage of the real group profiled in the original Journal story makes a better case for the feature-length documentary treatment. Maybe it’s impossible to expect substantial material from a story that already spawned an eight-minute “Sunday Morning” segment. As a summer comedy, it’s a game we’ve played before. “Tag” opens in theaters on Friday, June 15.